What is success in the Kingdom of God? Saw this CNN video at the gym today of a family of urban homesteaders in Pasadena who were living green before green was cool. Rising food costs don’t impact them since they grown their own food. If these people can do it on a tenth of an acre, what could I do with my yard? What if Christians were known for living sustainable lifestyles as a matter of routine? A search found their website, their YouTube channel, and blog. Seems they will be in the NYT Magazine this weekend. The best quote: ‘Asking questions, I guess that’s a dangerous thing.’ Amen, brother. Suburban mom sees a documentary about those who die in Africa for want of clean water. Every 15 seconds, a child dies from a disease that came from unsafe water. God starts working on her heart, gently prompting her to act. Way outside of her comfort zone, she organizes a neighborhood walk-a-thon so that kids can raise money for clean water in Africa and learn about the need. 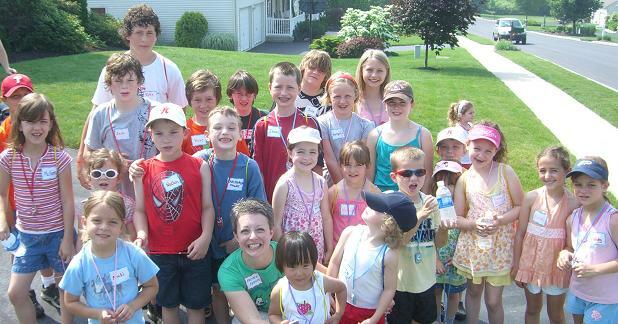 29 kids show up with their parents, far exceeding her expectations. So today, at the 2008 Walk for Water, kids raised $467 and counting; a good bit of money is going to help those who need help the most. The mom who was obedient to God’s call to help build his kingdom? My amazing wife, Kristen. It started out when we watched a Frontline/World documentary about Playpumps. I encourage you to watch it (under 7 minutes). Here is an African company working to provide a solution to a dire problem in Sub-Saharan Africa. We showed it to our kids, who were excited. And it is a concept they understood: $6 gives clean water to one person for 10 years. So we gave, but over time, Kristen heard God prompting her to do something more, something that would engage kids and neighbors. And she obeyed. A 10 year old along the walk around our neighborhood explaining to another kid how 2 million children die each year due to a lack of clean water, something she learned from the poster Kristen set up in our driveway. Another child explaining to me that water in Africa gets polluted because of cow manure near wells. My 7 year old daughter explaining why we we walking to one of her friends. One parent to another saying how nice it was to meet people in the neighborhood. Many parents thanking Kristen for organizing something that the kids loved and taught them something at the same time. Needless to say I’m incredibly proud of my wife. And I’m excited as we continue to look for ways to be the church in this neighborhood. For more information, please visit the Playpumps International website. The old gray lady, my preferred source of news, published an interesting article on young evangelicals and their views on engaging culture and politics. If you’ve ever wondered what is going on amongst emergent Christians, this is an example of how mainstream media is starting to understand them. Check it out. Giving is not really giving until it interrupts your lifestyle. What is giving? Here is a great starting point. What I like about this quote is that it resonated with the atheist (Casper) in the book Jim and Casper Go To Church which is the story of a Christian and an atheist who visit and reflect on their experiences at different American churches. Casper was more impressed with those churches that challenged people to step up and give in a real way to make a difference in the world. This quote bothers me, because it hits close to home. I like to think of myself as a generous person that teaches my kids to care about the least of these. Here at home we talk about the cyclone in Myanmar and the earthquake in China and we’ve given to support relief efforts. But has it interrupted my lifestyle? Has giving ever interrupted my lifestyle? Do I give up anything so that those without might have their needs taken care of? If I believe in the sacrificial way of Jesus, but don’t give sacrificially, am I really following him? What is giving to you? Most human activity is inherently theological, in that it reflects what we believe to be the case about God–who God is, what God wants from us, how involved God is in the world, and so forth. Almost every choice we make reflects what we think about God. I remember being shocked when I first learned that the Rwanda is basically considered a Christian nation. A theology that allows one to kill his neighbor means that theology matters. Today, April 25, 2008 is the first ever World Malaria Day. Malaria is a preventable, treatable disease that kills an African child every 30 seconds. It is a leading cause of death for children under 5 in Africa. Of course it has the biggest impact on those in extreme poverty. A simple insecticide-treated bed net is all that is needed to protect a family at risk. I heard a representative from Malaria No More speak at a symposium on Africa at the National Constitution Center. I was impressed by their organization — their representative spoke of their understanding that it wasn’t appropriate to enter a region with hubris, offering our American solutions to their problems. Instead, he spoke of humbly learning from village elders about the ways they were trying to educate their people and trying to support African solutions to this problem. Donating bed nets is something our kids can get excited about. Consider making a donation today in honor of World Malaria Day. A small amount of money can change lives and work to eradicate a scourge among the least of these. A blog where we journey together in learning how to love God and love others.